Gano's winning kick came after the Giants erased a 14-point deficit. Eli Manning hooked up with Saquon Barkley on a 15-yard touchdown pass down the right sideline - the rookie made a long dive into the end zone - to put the Giants in front 31-30 with 1:08 remaining. Manning finished 22 of 36 for 326 yards with two touchdowns and two interceptions, both by Panthers 37-year-old safety Mike Adams. Odell Beckham Jr., had a big game as a receiver and passer. 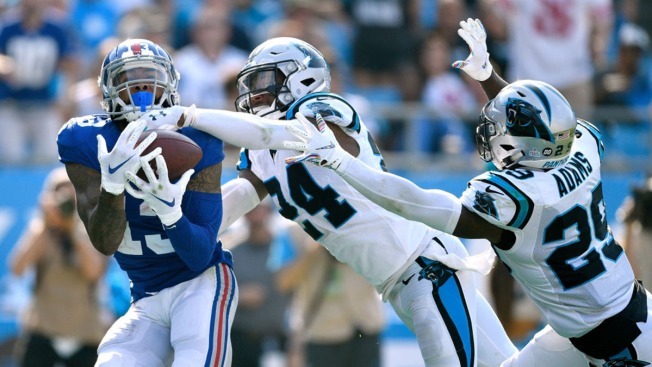 Beckham had eight catches for 131 yards and a touchdown and also threw a 57-yarder to Barkley for New York's first touchdown.